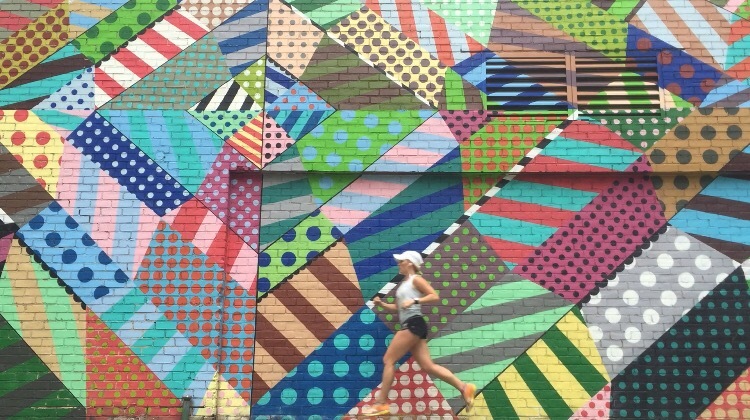 It is really bitter sweet that this marathon training season is coming to an end. 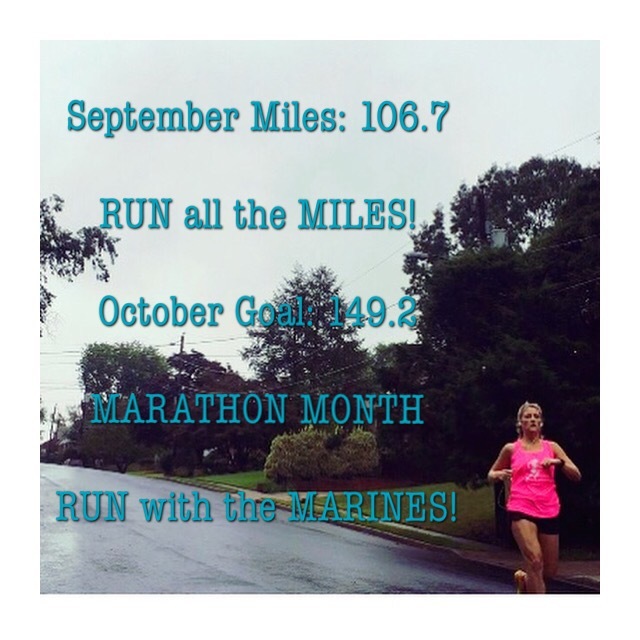 This will be my fourth Marine Corps Marathon. And although, I have trained and run this race before, MCM training 2016 has been by far the most special training season I have ever had. Most marathon runners, train with a running group or running buddy. But for me, I have done every weekly run pushing my baby girl in our BOB running stroller, and every long run completely solo. It truly has been the most fun, most challenging, most special training season because I did it all, while caring for a tiny human, pushing my daughter every mile of the way. 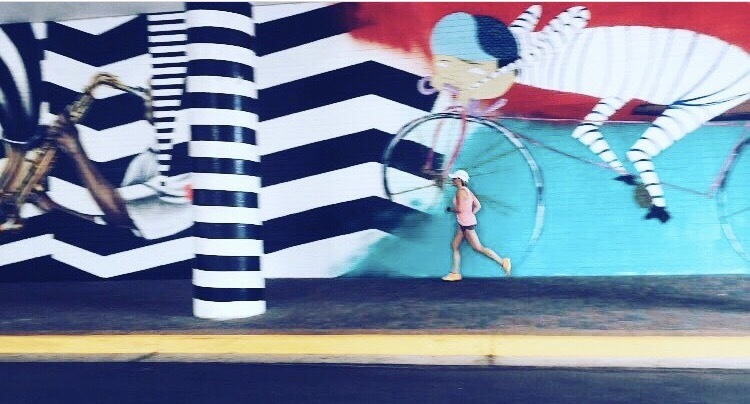 Regardless of whether I … PR or not, I am most proud of the fact that I was able to manage a beautiful life-balance of wife life, motherhood, marathon training, and working. When I signed up for this race, at 6 months postpartum, I was unsure I would be able to manage training for a marathon while being a new working mom/wife, but I did it. Once again, the marathon has taught me, that anything is possible. I am so proud that after 40 weeks of pregnancy and no running, a c-section labor, breastfeeding, sleepless nights, etc. that I was able to physically get my body strong enough to begin to train for a marathon. And then continue prepare for this race during a record breaking hot summer, with an infant/toddler by my side. The female body truly is amazing. A lot of people have asked me, how did I do it physically. How did I get strong enough to even start training for a full marathon, after 40 weeks of pregnancy and no running. 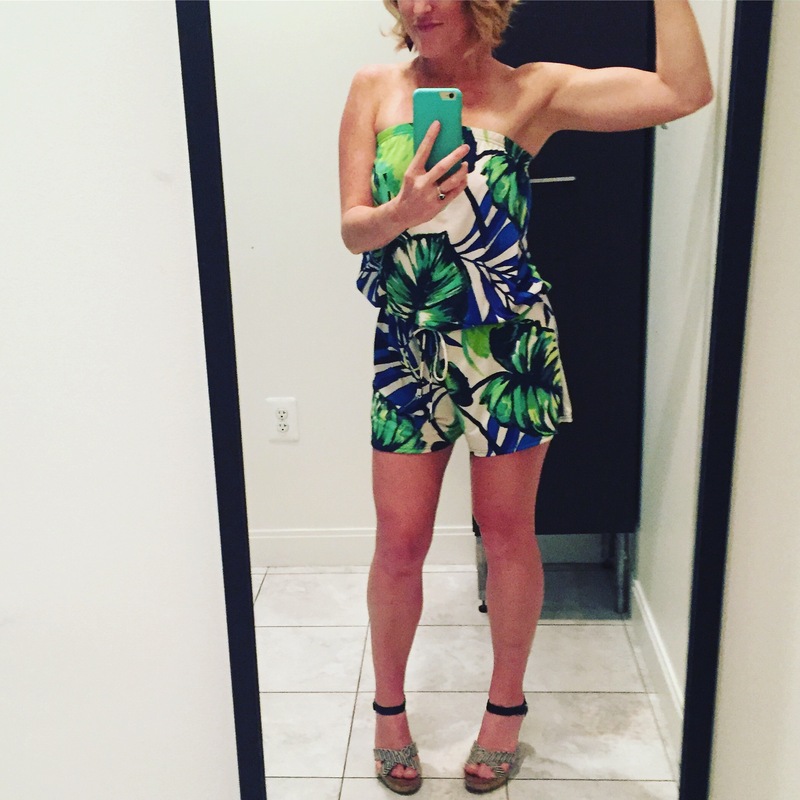 At 7 weeks postpartum, I got the okay from my doctor to start working out again. I desperately wanted to start running, but I knew I had lost a lot of muscle. I knew I was weak, so I decided to exclusively weight lift/strength train for 6 weeks. I had to get stronger before I laced up my running shoes. 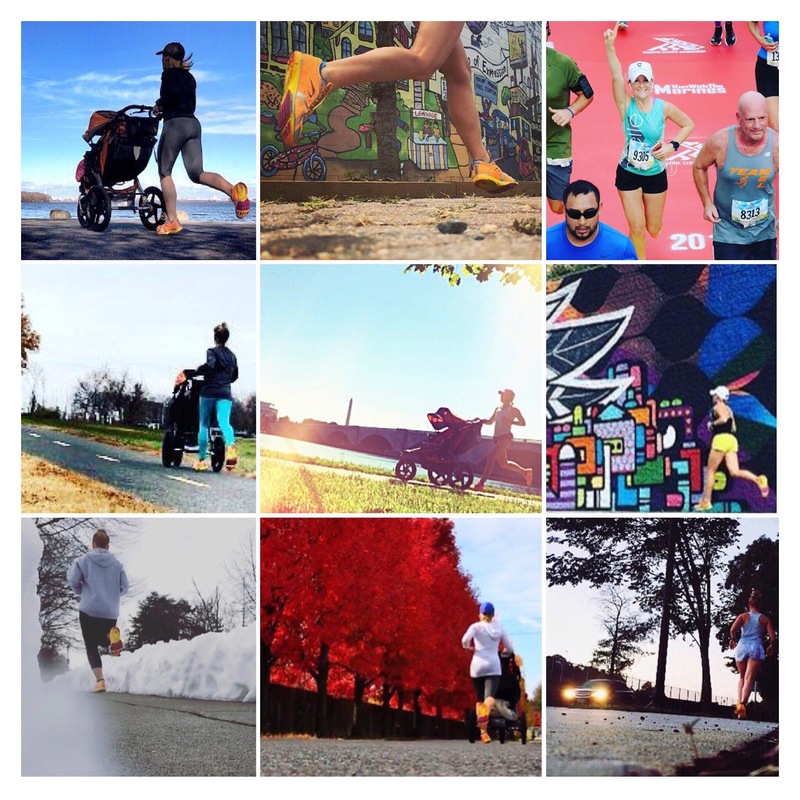 At 13 weeks postpartum, on Thanksgiving day, I went for my first postpartum run. It was a three mile run, and it felt amazing. But the next day I woke up with the worst knee and ankle pain. I later went to my local running shoe store to get my form evaluated and fitted for new shoes. My body had changed, there was a great possibility that my running form was different. Turns out my form was perfect and my shoes were a great fit, it was just going to take time for me to strengthen my ankles again. For the next 3 months, I hit the pavement running a short 2 miles a day. On the weekends, I would try for 3-4 miles. Slowly, I was improving. 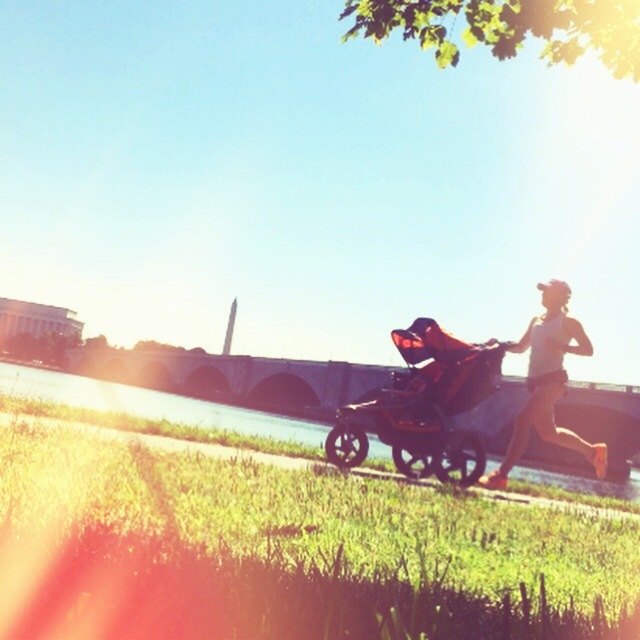 At 6 months postpartum, my daughter was ready to run with me in the stroller. She had strong neck control and was sitting up independently for two and half weeks. She was ready, and I was too. 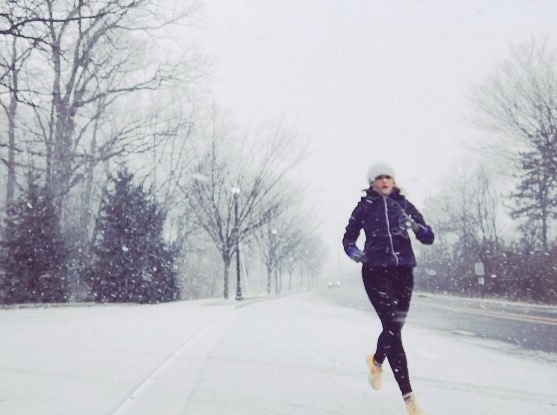 I was so glad I took the time before to build up my strength and perfect my running form solo. It made me ready to push that stroller. At first while pushing the stroller, my stride was different – longer, slower cadence, but over time I found my mojo, and running with Zoe became one of my favorite things. Pushing a stroller and passing people on the trail made me feel strong and empowered. I have become a BAMR!! Although, I always put my focus on how well my body preforms vs. what it looks like. Another great perk to training for this marathon is that running totally transformed my body. I have lost all the stubborn baby weight, and my body is leaner and more athletic. Do not rush into it, and expect you will have your pre-baby body back. Actually, the truth is, YOU WILL NEVER HAVE YOUR PRE-BABY BODY BACK, but that doesn’t mean your body can’t be stronger, leaner, or even better than before. Just know that it takes time to get strong again, and embrace the process. 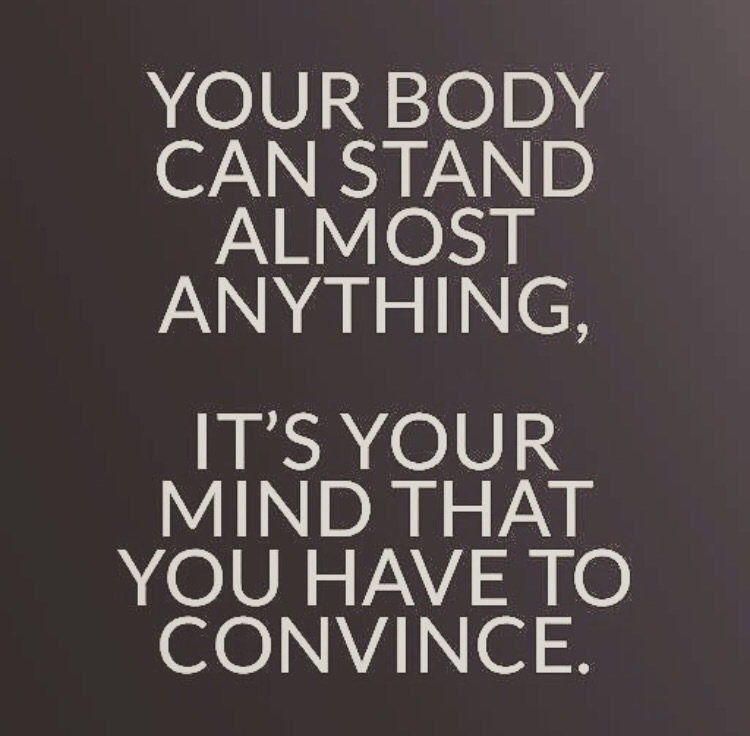 And forget about what your body use to be, and start creating an even stronger better body. It is possible. Hello fit beautiful mom-bod! I am most proud of beating the record breaking summer heat mentally and physically. And becoming better with time management. Everyone is on a “flexible” schedule in my house. 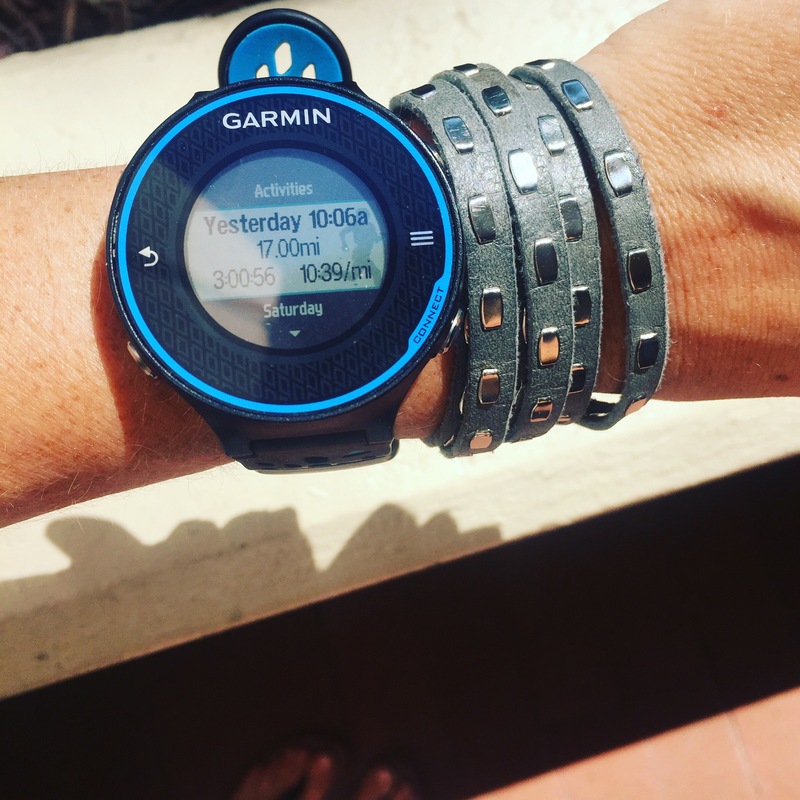 The demands of marathon training, and the time commmitment was possible because I made it part of our morning routine. 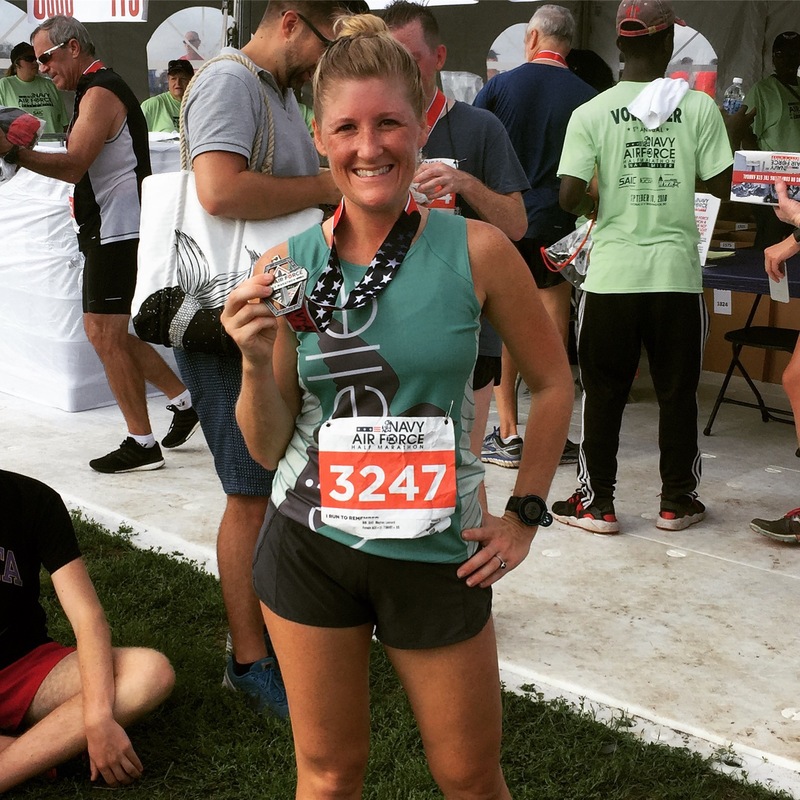 Because of the heat my pace was significantly slower… It made me question, “Can my body run this race at the pace I want?” But, physically, I knew my body could do it, I just needed to get my mind prepared. I am so happy I was organized enough. Planning a head is key to having good time manage. Making running part of our morning routine made everything doable. I’m still mentally preparing. However, it will feel more real once I pick up my T-shirt and bib. The energy at the expo is always such an amazing feeling. This year Zoe will be with me. She’s my little side kick and I wouldn’t have it any other way. My favorite runs are always the ones I do during the week with Zoe. During this training it was amazing to run when she napped peacefully, or run when she was interactive- pointing at everything, waving at the cyclists. She talks to me, and she absolutely loves going over the wooden plank bridges on the trail. She is always a great help holding my cold water bottle on hot days, that would keep her cool. Then we would stop for a water break, she loves drinking from my water bottle. However, I had some really great long runs too. 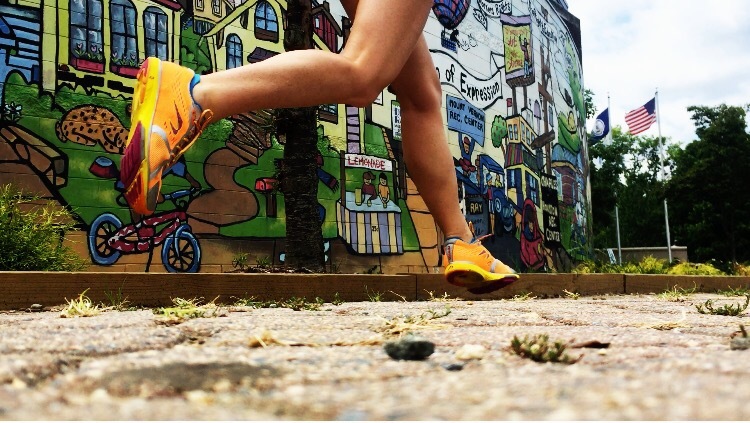 My favorite long runs were, my 12 mile runs, my 15 mile runs, my half marathon, my 18 miler and my 20 milers. 12 Mile Run – One of my first 12 mile runs, I ran with my sister Emily. This run was the only long run I had company for. The weather was overcast, and I felt great the whole run. 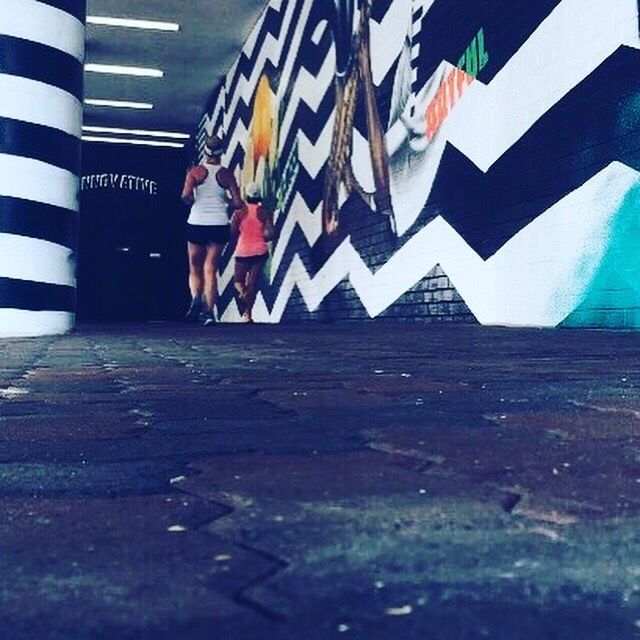 We ran passed a really cool piece of street art and it made me obsessed with finding more are to run past. 12 Mile Run- Earlier, this month when my husband, Zoe and I visited Idaho, I went for a 12 miler on the Boise Green Belt. It was perfect running weather, such a refreshing treat compared to the heat wave we were having back home. I found a dirt path to run on, the sun was shining and the view of the Boise River was so gorgeous. So perfect! 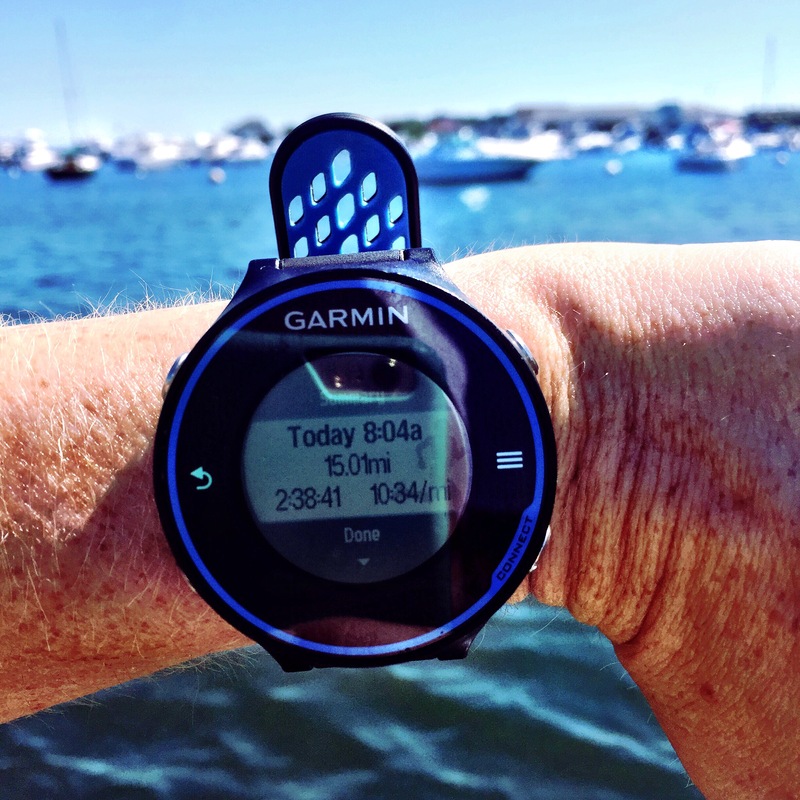 15 Mile Run – In August, while I was in Martha’s Vineyard celebrating my daughter’s first birthday, I ran a 15 miler along the beach. It felt amazing, running along the ocean, with the sun shining and the ocean breeze. I also saw a huge spider web, and kept seeing spider webs on every long run after. 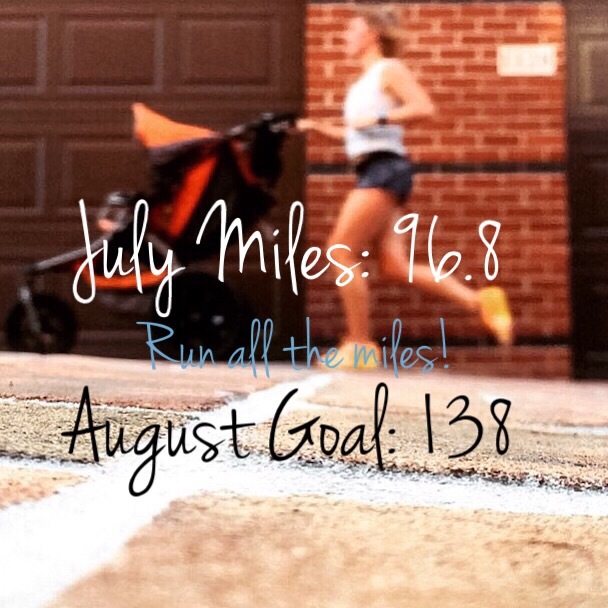 15 Mile Run – All of my runs during this summer were done in 80 or 90 degree heat. I had a 15 miler on my schedule, but the weather man was calling for record breaking heat, and advised that everyone stay cool and drink plenty of water. Well, that’s not going to happen, when I am in the middle of marathon training. I was dreading this long run. I don’t do well in the heat, but who does? I headed out early and went in the direction on the trail where it was the shadiest. Tree branches canopied over my head and I basically was running through the woods. The shade was good, but the humidity still made it sweltering, plus the shadiest part of the trail ended up being the hilliest. I decided to turn my music off and listen to the audiobook, Born to Run. I listened to the chapter that talked about Scott Jurek running the ultra Badwater. It helped me get through the last tough miles. I also found the other runners on the trail very motivating. One guy even gave me a thumbs up and hollered , “Nice Job.” This kind gesture, made me remember that even though I ran my long runs solo, I wasn’t ever really alone. There were other runners out there in that very hot day, running high mileage, just like me. 18 Mile Run- I chose to do my 18 miler on a Monday instead of Saturday because the weather was a little cooler. My mom watched my baby as I hit the trail. 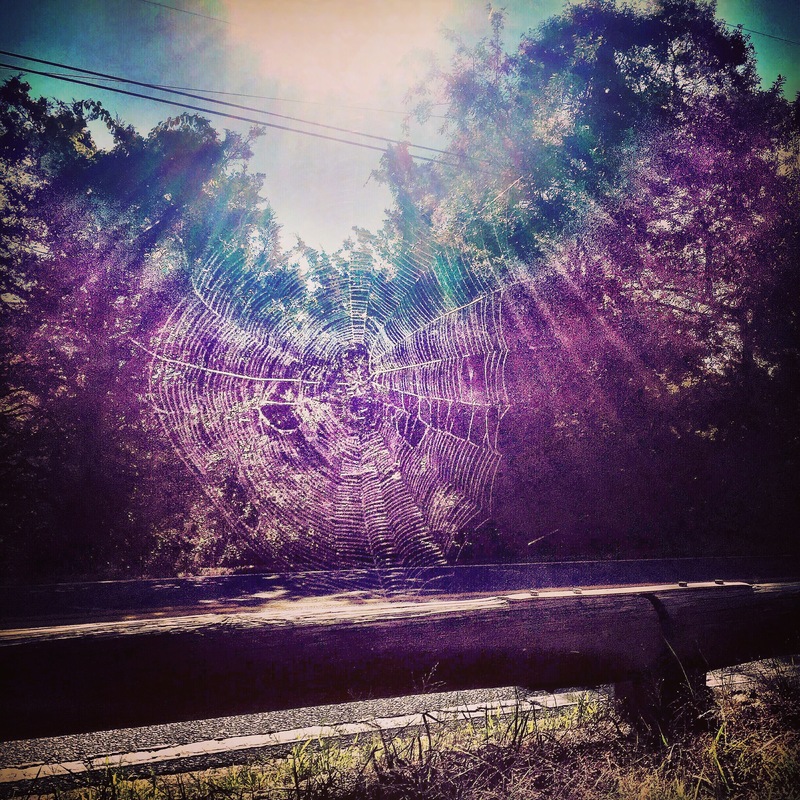 It turned out being a beautiful run, and I made great timing. 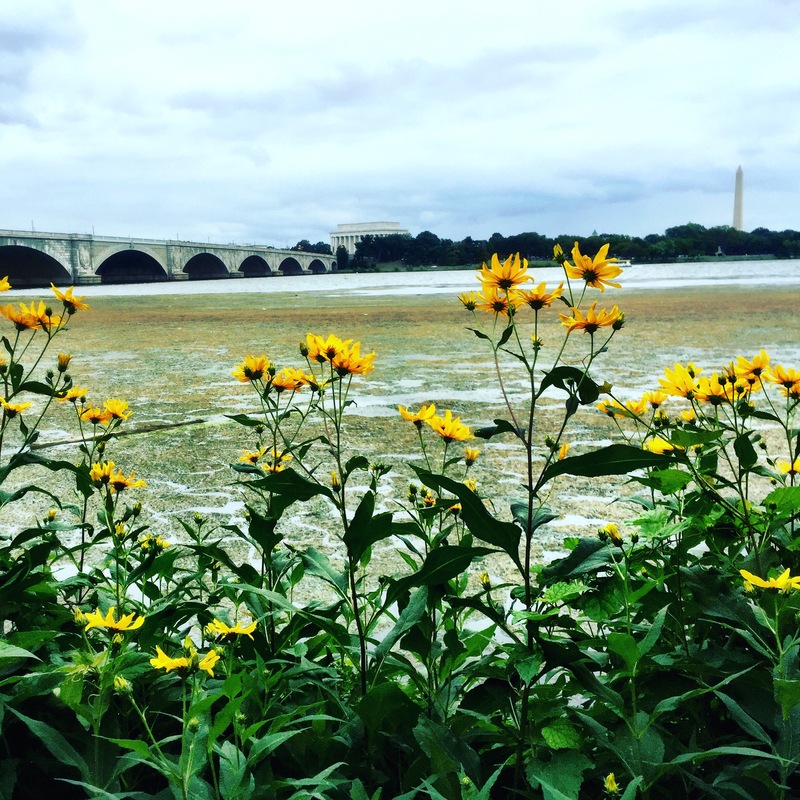 Half Marathon – My training plan had a half marathon scheduled for the same day that the Navy Half Marathon was scheduled in DC. Because the Army 10 miler is a couple week later (which is very popular) the Navy Half never fills up. So last minute I decided to register for it. Most of the other people I knew running it that were also running MCM were using it as a training run. I decided to race it and boy am I glad I did. I ended up running an awesome time, 1:53:54, and felt great the whole time. This race brought me my confidence back. 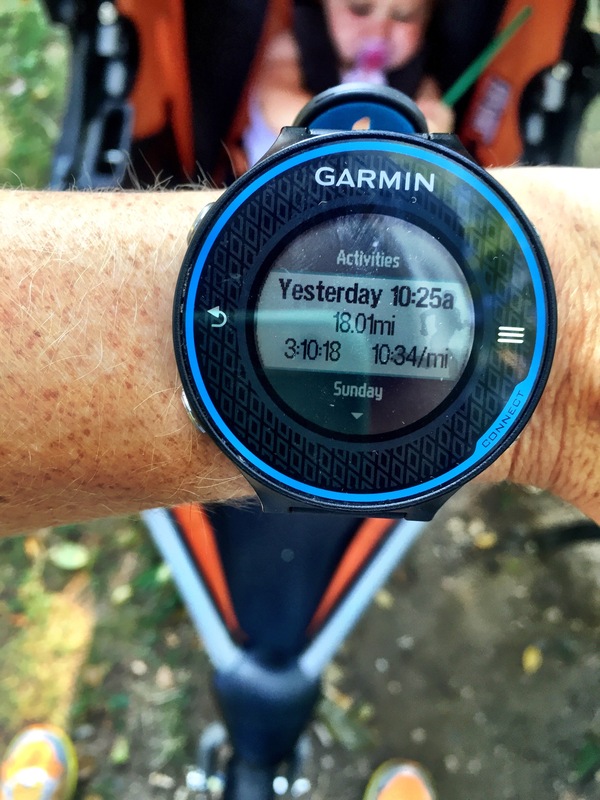 20 Mile Run – It is just 10 miles down And then 10 miles back. I decided to run this one from my house. It ended up being an awesome run. I came across another mural in Roslyn. Then I jumped on the trail to have some gorgeous views of DC. I finished in 3:40 so my timing was on point. It was good to get a really nice 20 miler done. 20+ miler – I normally always do a 21 miler, just because mentally it helps me finish. I run 5 mile easy runs during the week, 21 ends up being my longest run. Then during the race when I hit 21, I tell myself, “Oh good, it’s just my 5 mile easy run.” It works every time. This 20+ miler was suppose to be my 21, but I was rushing out the door and didn’t get enough to eat. So around mile 15 my stomach started growling. I was starving. I ended this run at my car around 20.40 miles. I immediately went to Starbucks and grabbed a kind bar and a venti soy chai latte. 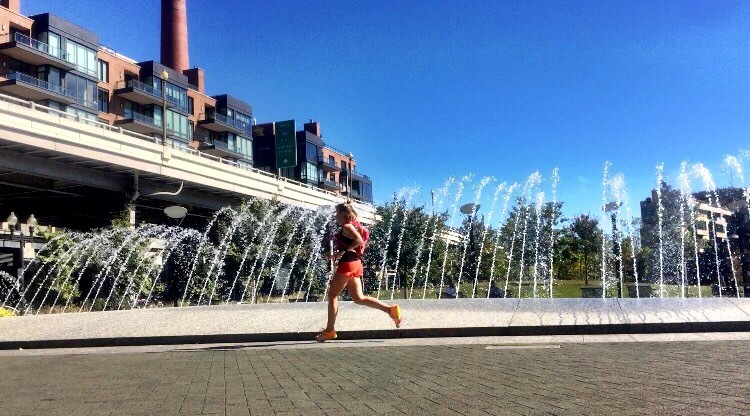 Besides that, I ran through the sprinklers in Georgetown and hit up all the bridges including the 14th street bridge. 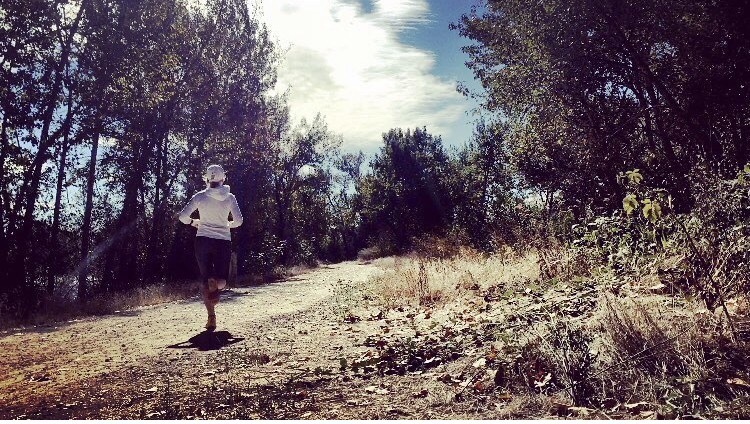 This training season I tried to be very active in the online running community. 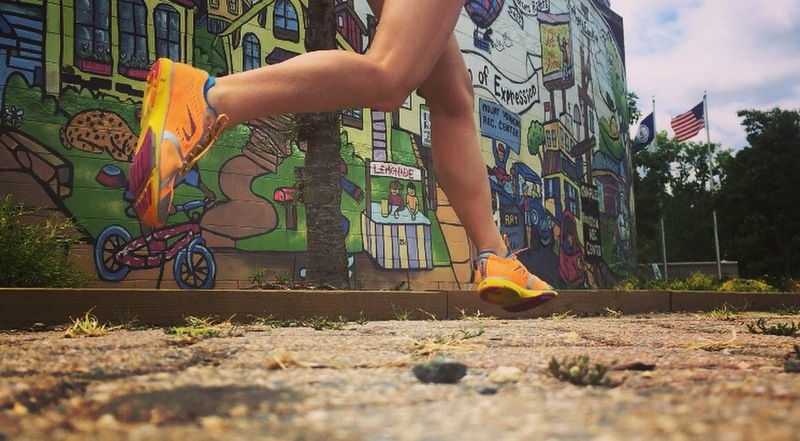 I joined two running groups, Oiselle Volee and Mom’s Run this Town. And although, I only went running with them once, I was able to get support from them by posting online. 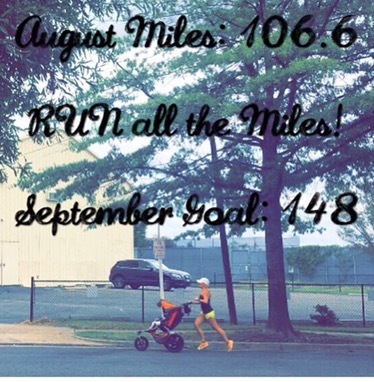 I also noticed through Instagram that many runners were setting monthly goals. I decided to do the same. 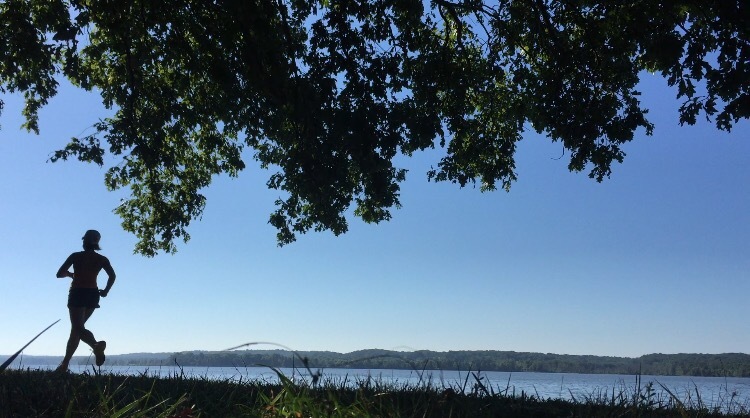 Although, there were days that I dreaded running in the heat, and days that I worried if I could fit my runs in my busy schedule… Overall, I really enjoyed this training season. You are dear to my heart Marine Corps Marathon. Always teaching me that the possibilies are endless. No matter what happens race day, this training season has been unforgettable. And the best part is having Zoe by my side every mile of the way. She is not my EXCUSE… She is my REASON. Now let’s run all the miles, with the Marines! Labels: Marathon Training, motherhoodTags: fit mom, marathon training, marathoner, marine coros marathon, motherhood, run a marathon, run with the marines.